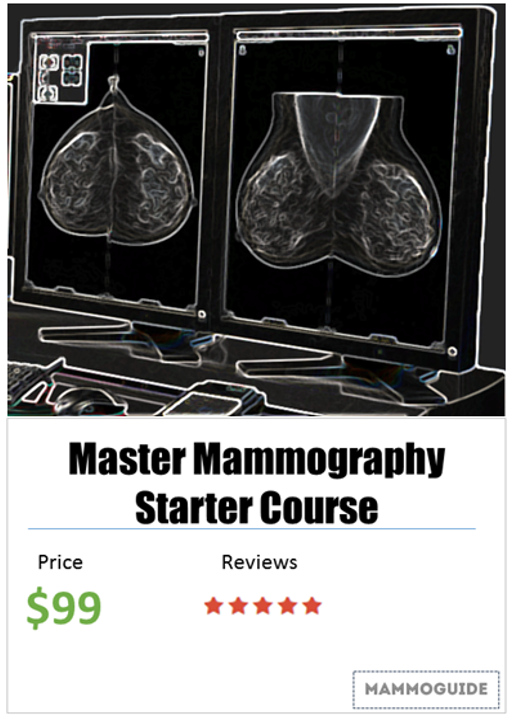 58 year old female presents for screening mammography. 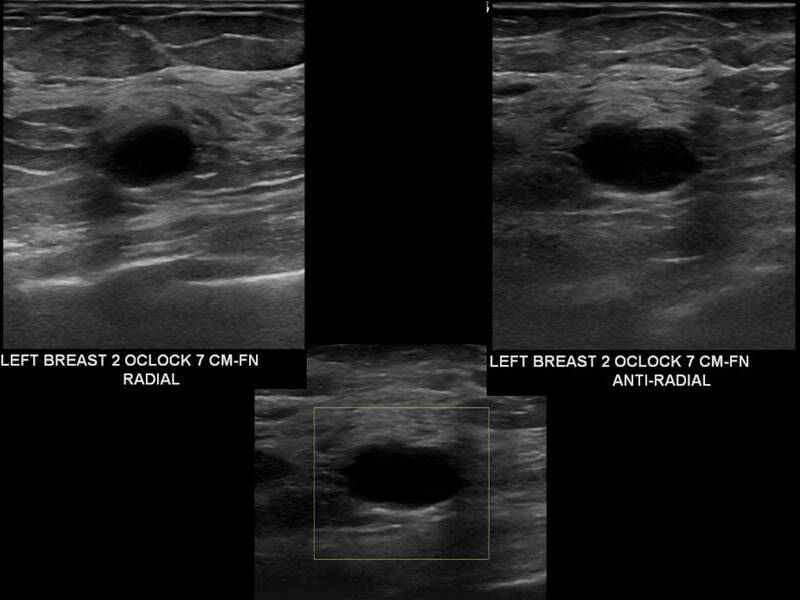 Screening mammography shows a well circumscribed mass in the upper outer left breast. 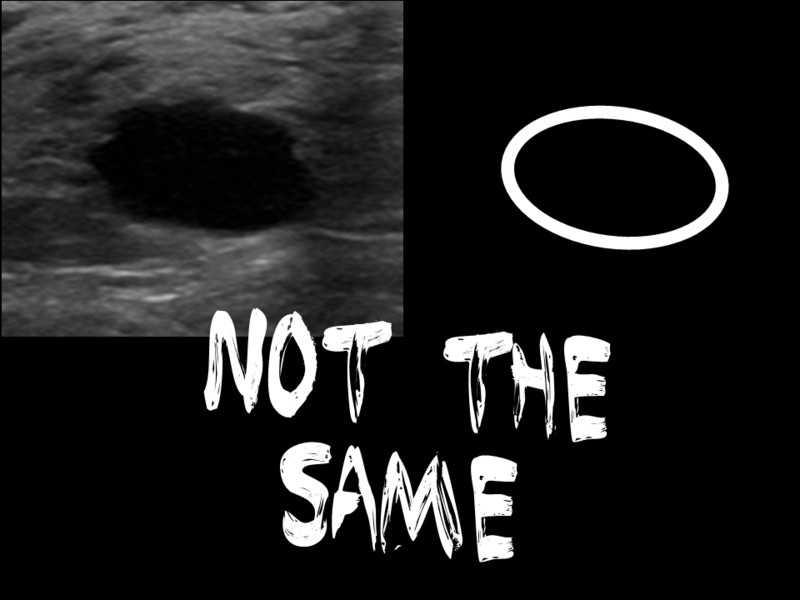 Diagnostic images confirm a circumscribed isodense mass. Ultrasound evaluation shows an oval anechoic mass with slightly angular margins. At first glance this looks like a boring simple cyst. But Watch Out, it’s a trap! There is a well-circumscribed mass in the upper outer left breast which is nearly anechoic on ultrasound evaluation. However, closer evaluation of the sonographic margins of the lesion demonstrate that it is not perfectly smooth and circumscribed. It has slightly angular margins, which make it suspicious. This case is a triple-negative grade 3 invasive ductal carcinoma. This is a bad actor, that you do not want to miss. Very aggressive grade 3 invasive ductal carcinomas are often fairly well circumscribed and anechoic. They are growing too fast to develop surrounding fibrosis/spiculation. Avoid misdiagnosing this case by fully evaluating the margins of every lesion. A cyst or benign mass should never have angular, microlobulated or irregular margins. Check out our comprehensive video guides to learn more.